19-year-old Paul Lee, who had a severe form of autism, was left inside a hot bus for several hours. 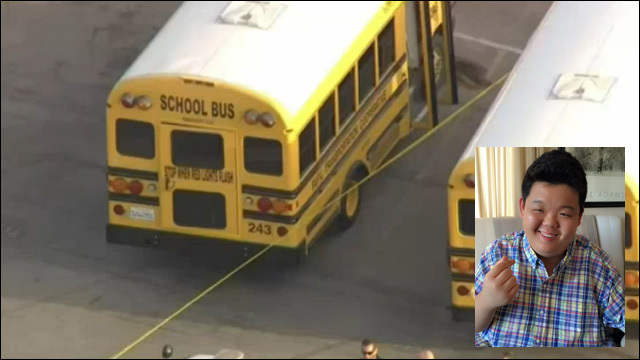 This is awful news out of Southern California... On Friday afternoon in Whittier, a special needs student was found dead inside a school bus. While the cause of death is still under investigation, it is believed he was on the hot bus for several hours while temperatures soared. 19-year-old Hun-Joon Lee, also known as Paul, boarded the bus on Friday morning. That afternoon, police found himfound lying dead in the aisleway of the bus, which was parked in the school district parking lot. The substitute bus driver apparently forgot Paul was onboard. The Lee family questions how Paul, who had a severe form of autism, stood 5-foot-11 and weighed almost 300 pounds, could have been overlooked. They believe he was the on the bus and forgotten for almost nine hours. The Lee family questions how Paul could have been overlooked. They said there were only three other students who rode their son's bus and he was the last one to board. The trip to the school from his home lasts about six minutes and Paul was not a small person. He was 5 feet 11 inches tall and weighed almost 300 pounds. The Lees said he may have been the size of a man, but he had the mind of a toddler. His mother, Younha Lee, bathed him, brushed his teeth and combed his hair daily. Paul could not speak and so he had no capacity to yell, let alone knock on the window of the bus he was trapped on. "He cannot speak out even one word. He cannot ask help," his mother said. Police are calling the death suspicious, but they don't know yet how he died. The Lee family has established a GoFundMe account to help with funeral costs. On September 11, 2015, my one and only autistic brouther, Paul, was found dead in the school bus due to the school faculty members' lack of awareness of his presence. Inside the bus was about 120 to 130 degrees fahrenheit and Paul was trapped in there for almost 9 hours without a single drop of water. My family is completely torn apart and heart broken, knowing what he had felt during those painful hours. We are hit so hard with this sudden tragedy. My name is Eiden, Paul's older sister. All donations will go directly to my parents to help defray the costs of funeral expenses. Please keep Paul and our family in your prayers. Those who wish to donate can do so here.